TED regular Rives brings a whole new meaning to the phrase &apos;beat poet&apos; (and also the phrase &apos;right hand man&apos;) in this poetic, musical story from TEDxSydney 2011. A storyteller and poet, Rives is the star of the new special “Ironic Iconic America.” A regular on HBO&apos;s Def Poetry Jam, he&apos;s the co-host of the upcoming TEDActive simulcast event in Palm Springs. Offstage, Rives designs and writes pop-up books. 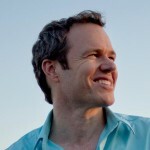 Rives is coming to Sydney to perform as part of the Sydney Writers&apos; Festival.